While figuring out how to attack my distressingly long ‘to do’ list, I came to a crystal clear realization: there are three ways to keep your ‘to do’ list at a reasonable length. Say no to things. This tactic is perfectly reasonable when you have an understanding of priority, ownership, context, etc. Simply put: don’t put things on your ‘to do’ list that aren’t worth doing. Delegate. Assign the task to someone else. The ability to effectively delegate is one characteristic that separates good leaders from bad. No individual can do everything; leaders and teams achieve greatness only when tasks are appropriately delegated. TCB (take care of business). In other words, focus and get (sh)it done. This is my favourite tactic – old reliable. I take great satisfaction in completing a worthwhile task, and if I find myself working on something crappy and tedious then I just blast through it for the spiteful pleasure of getting it done. Now this may seem silly to you, but I’d just never thought about the list this way before¹, and the clarity feels empowering. Plus, judging by the length, I’ve done a lousy job at tactics one and two. Usually, when I think about work, I see an infinite list of things that I want to get to. Infinity goes on for quite a while, so this way of looking at things can be a bit overwhelming at times. 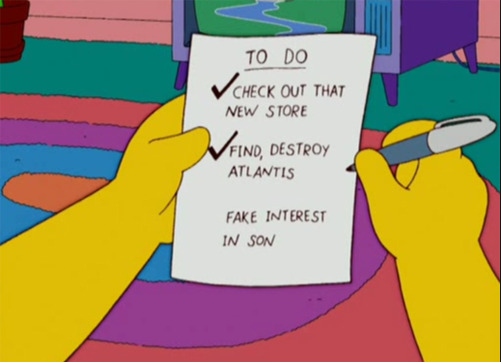 However, by keeping a delineation between the actual ‘to do’ list and the ‘infinite stuff I’d like to do, maybe, someday list’, I can retain focus and work on what matters. And by carefully managing my ‘to do’ list with the tactics above, I can ensure that it doesn’t become too long to the point where overhead leads to poor performance and diminishing returns². The second item on the list could have been delegated. ¹Which is odd, because I love order and structured trees. I think I’d just fallen into the trap of doing everything. ²We can only actually keep track of so many things…if you’re constantly facing an enormous list, then the sheer mental strain can be distracting, and you might find yourself bouncing from task to task inefficiently.